The entertainment capital of the world, Los Angeles, boasts an eclectic set of attractions from the Hollywood walk of fame, to delicious ethnic cuisine, beautiful beaches and hi-glam night life. Attracting nearly 50 million visitors annually, it is no surprise that hospitality and events are leading industries in LA. With tons of venue options for hosting an event, here are 25 of the best Los Angeles event venues to check out. Before we dive in, if you're searching for the perfect event venue, we invite you to download a free event venue ebook that will show you how to find and design an event venue that really wows your audience. Click the button below to get the ebook. Previously know as the Club Nokia, this venue located in the downtown L.A. Live complex has been rebranded as the Novo by Microsoft. You may know this venue for its high profile musical performances. Since it boasts 59,000 square feet of space with a VIP lounge, the Novo can easily accommodate a large-scale event. If you have the budget to hold your event at the Palazzo Beverly Hills, you will be treated to four acres of land and a panoramic view of the hills. This venue can definitely cater to your event, whether a large scale celebrity event or an intimate gathering, though organizers should be prepared to spend a pretty penny as this venue is considered luxurious. This 54-story downtown Los Angeles hotel is a world-class entertainment, sports and dining complex. Enjoy state-of-the-art meeting and event spaces, a lavish spa and rooftop pool, and unrivaled access to top attractions. Featured in the photo above is the Diamond Ballroom with 25,086 square feet of space able to hold as many as 2,800 guests. Loft at Liz's is a 1,200 plus square foot New York style loft with weathered hardwood floors, wood ceiling beams and plenty of natural light. A fine art gallery that is open to the public daily, where exhibits are changed twice a month. Two staircases lead up to the loft: one is accessed through the store and a private entrance is conveniently accessed through a back alley. A smaller private room off of the main area can be used for a full bar or DJ set-up. This is an ideal space for organizers hoping to build intimate yet trendy events. 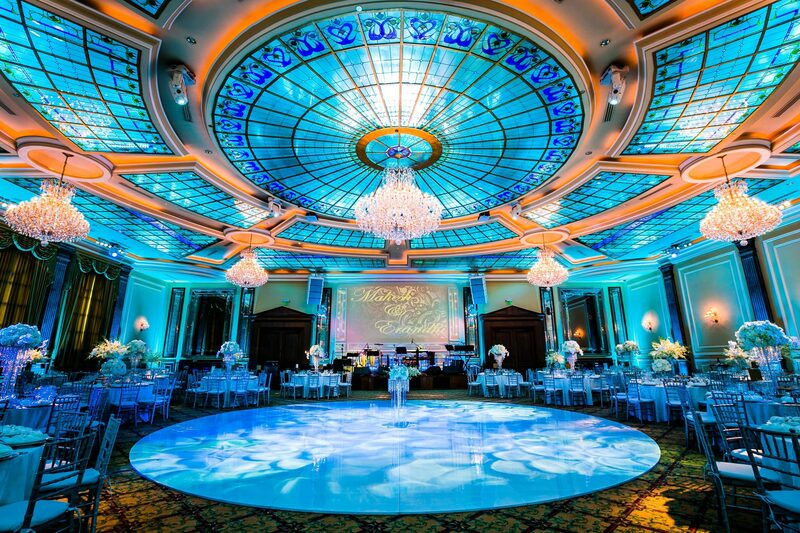 Located in the heart of Los Angeles and one of Southern California’s most noteworthy venues for various events, Taglyan Complex offers beautiful European-inspired décor replete with a custom-made 5,000 square foot stained glass ceiling. This venue is perfect for large corporate conferences, movie screenings and awards banquets. This LA event venue features great audio equipment and HD drop-down projector screens. Hosting an average of 300 events a year, the Los Angeles Convention Center is the choice for hosting trade shows, conventions, exhibitions, and other large-scale gatherings. With over 860,000 square feet of space, the LACC offers a multitude of venue staging options. A celebrated LA skyline landmark, The Westin Bonaventure Hotel & Suites, Los Angeles dazzles with its first-class conference center. As the city's largest convention center hotel, it offers options for events ranging from small executive meetings to large-scale events of 3,000 attendees. Built in 1926, the Shrine Auditorium mixes old school architecture and modern technology. Designed in the Moorish Revival Style of the 1920s, the auditorium is perfect for performances and keynote speeches. The Shrine Expo Hall on the other hand is 54,000 square feet of multi-functional space split between 2 floors. A few blocks away from the Staples Center, the Hudson Loft contains 3,600 square feet of total space divided among 4 different lofts. It features floor-to-ceiling factory-style windows with breathtaking panoramic views of the L.A. skyline. This is a fantastic event space for tech networking events, art showcases, or any other gathering that is forward-thinking. The Magic Box is one of the most distinctive event venues in downtown Los Angeles. This LA landmark has played host to countless productions for special events and trade shows as well as for art, design, fashion, film, television, advertising and the music industry. Featuring 100,000 square feet of event space, The Magic Box offers organizers with a lot of options when it comes to staging their next event. Originally known as the first Archdiocese Catholic Cathedral of LA, Vibiana, is located in downtown LA. The event venue has a stunning Main Hall and Garden Courtyard for events from entertainment to corporate to non-profit, and boasts state of the art lighting and sound equipment. One of the most unique venues in Los Angeles, the Carondelet House was constructed in 1928 as an Italian Villa. The venue today still showcases its history thanks to hardwood floors, high beamed ceilings, brick walls, two exterior courtyards, and expansive rooms. The Unique Space has an interior space of 3,500 square feet that can be turned into a stunning event space. Housed in a historic factory, The Unique Space features exposed brick, high ceilings, and wooden floors, making it feel trendy and industrial. An exclusive 13th-story artifact of Art Deco splendor, this 1927 landmark was once the residence of James Oviatt. The penthouse now lends its sophisticated elegance and a 360-degree view of the downtown L.A to event organizers fortunate enough to host an event there. With its Parisian glass-work and rose-colored velvet chairs, the Oviatt Penthouse will give attendees an event experience like no other. With over 30,000 square feet of indoor / outdoor space, the SLS at Beverly Hills features exclusive menus by Chef José Andrés, a legit A/V system to manage event tech needs, and a mixture of space options including flexible pre-function space, banquet rooms, breakout suites and outdoor patios. One of LA's most versatile venues, The Casa Vertigo boasts over 88,000 square feet and four floors of truly dynamic event spaces, including a 13,000 square foot rooftop with panoramic views of Los Angeles. The possibilities within this event hotspot are endless. Originally built in 1931 as a Vaudeville theater, one can only imagine its impressive art deco and magnificent interior design. One of the largest theaters in Los Angeles, it can admit up to 2,300 people for an event. The Natural History Museum provides a change in scenery from the rest of the venues on this list. Rather than hosting events in banquet halls, this venue allows organizers to host a gathering among iconic museum exhibits. Most events begin in the Grand Foyer or the Rotunda and can move into the African or North American Mammal Halls. The Walt Disney Concert Hall, a renowned Los Angeles landmark, provides spectacular design and architecture, both on the inside and outside. Its Founders Room sits 150 people and its Blue Ribbon Garden showcases a wonderfully lush atmosphere that's an true oasis on a hot LA day. The W Los Angeles, a luxury hotel creative in approach and innovative in design, can host an event between 20 to 200 people. They specialize especially in junkets, corporate events and launch parties. Opened in 1973, the Sheraton Los Angeles can transform your event with its 26,000 square feet of event space. The hotel includes small and large meeting rooms, a flexible outdoor space and is equipped with the latest technology, including wireless high-speed Internet. A venue since 1991, The Olympic Collection has unique interior design elements found throughout the 35,000 square feet of space divided between 6 different ballrooms. Some internal features include imported marble floors, Venetian Crystal chandeliers, custom wood mill work, hand-painted frescoes and padded raw silk upholstered walls. Originally known as Verdugo Hills Country Club, Vertigo Event Venue is now a modern-contemporary Los Angeles event space. Events from networking gatherings to corporate conferences can be held here. 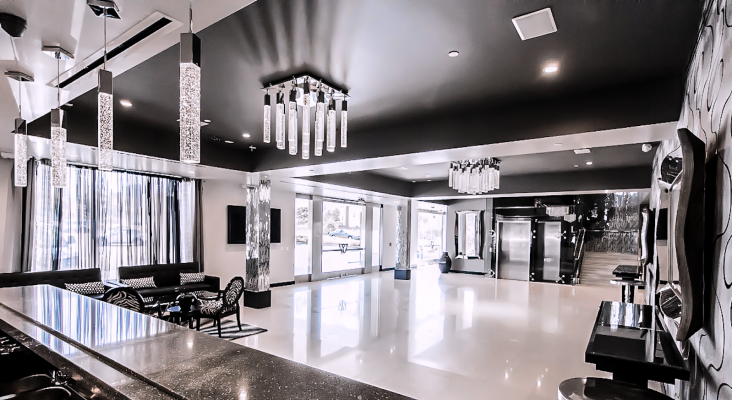 It offers four different spaces: a ballroom, banquet hall, lobby, and bar. One of the most sustainably designed space in all of America, SmogShoppe is 100% solar powered. The space is 6,500 square foot event space of pure plant heaven. The site can accommodate up to 250 people and professional event management can be provided. 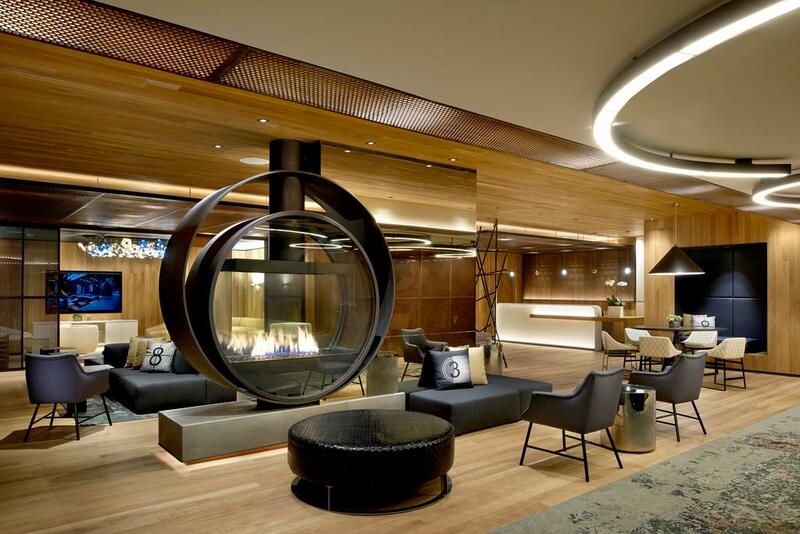 Located on Whilshire Boulevard, the Kimpton Hotel Palomar Los Angeles Beverly Hills hosts a space of 5,000 square feet. Given that this venue is located in iconic Beverly Hills, it is a great spaces for organizers hoping to create a glamorous event. For even more help with designing event venues in Los Angeles or any other event planning tips and tricks, download our free ebook by clicking the button below!